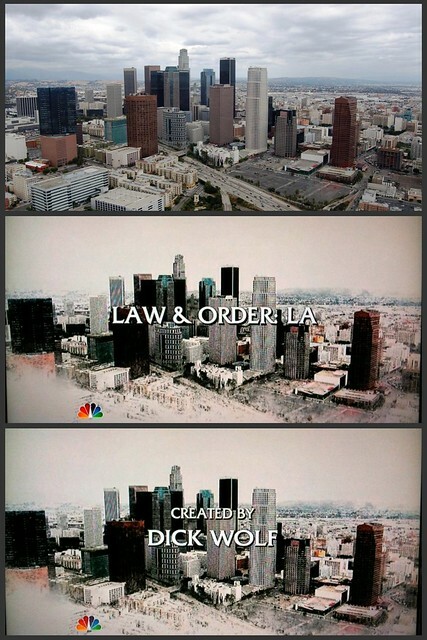 PRODUCERS FROM Law & Order: Los Angeles purchased my aerial photo of downtown LA (top) for the new season's main titles (middle, bottom), debuting last night and repeating throughout the season. They found me through a Getty Images group on Flickr. Have to say, it caps a lovely, dramatic, new opening sequence on the show. Quite an honor. 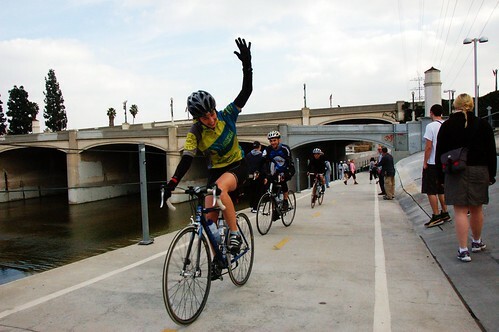 HERE'S MY SNAPSHOT of cyclists rolling north along the Los Angeles River bike path, gratefully receiving impromptu applause from the group of walkers touring Glassell Park and Atwater Village. (Tour led by LA's "stair master," Bob Inman.) 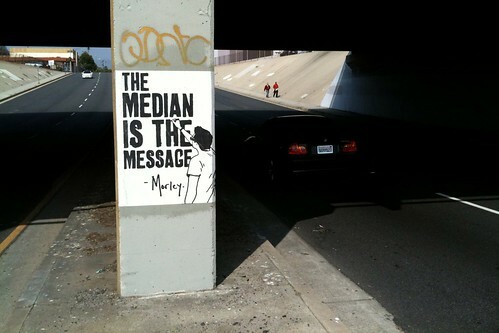 As seen on The Source blog of LA County's Metropolitan Transportation Authority (MTA) and my Flickr stream. In early 2011, a new restaurant — the ATX Eatery — will warm the hearth of the complex with a menu built around the highest quality ingredients, a true passion for freshly prepared food, and a state-of-the-art Italian wood burning pizza oven. Vegetables and herbs will be grown on an onsite linear farm, with meals served in a marvelous 4,000 square foot patio and a permeable indoor dining area. In the evenings, this dining area will host an eclectic mix of live jazz and classical music, as well as curated film series and performances. 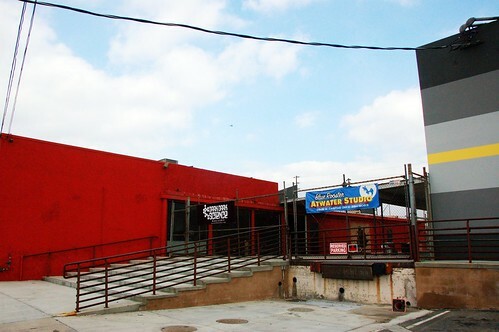 The Atwater Crossing complex already hosts creative spaces like Dark Dark Science Gallery and Blue Rooster Studios, all just a block down from Atwater Playhouse. As always, with interesting neighborhood news, email atwatervillagenewbie@gmail.com. On January 5th, 2011, two elderly distraction burglaries were reported, one in Elysian Valley and the other in Atwater Village. In both incidents, a male suspect posing as a contractor accompanied the victims to their back yards to discuss wall repairs. While there, a second unknown suspect entered the victims homes and removed cash and jewelry. 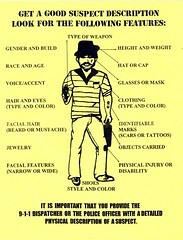 The primary suspect is described as a male Hispanic, 5'3" to 5'6", 185 to 200 lbs., 30 to 45 years old. The vehicle used is decscribed as a silver pick-up type truck. Of course, report emergencies to 911, non-emergency police phone calls to 1-877-ASK-LAPD. 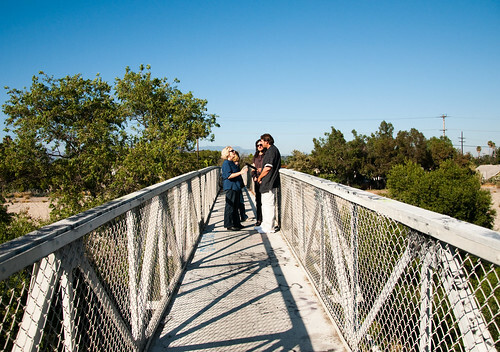 NANCY RIGG, who lived on Valleybrink Road in Atwater Village in 1980, meets James Ventrillo 30 years later on the Sunnynook footbridge over the Los Angeles River in this photo from SCPR. Nancy's fiancé, Earl Higgins, died rescuing James from the river on this spot 30 years ago. 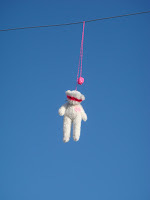 Listen to the amazing story on today's Madeleine Brand Show. Tickets are $15 each and reservations are required, (323) 769-5808.